For those who appreciate a classic refined appearance, these metal shingles provide the distinctive look of smooth, uniform tile. 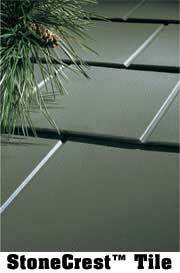 StoneCrest Tile Steel Shingles provide performance and value. 50 year limited wind warranty, protecting against damage from winds up to 110 mph. See Limited Warranty for details. Our Steel Shingles are specially coated with Kynar 500/Hylar 5000 fluoropolymer paint for resistance to fading and chalking. If you are looking for a fast, free, “ballpark” metal roofing quote based on square footage then you’re in the right place. If you would like a truly complete, accurate, metal roofing quote then you can ask for a detailed metal roofing materials and cost analysis. Need help? Click here for roof measurement information. Include Trim? Check this box to include the various trim usually required for metal roofing (eave, gable, ridge cap, etc.). Include Synthetic Underlayment? If you provide your email you will receive a copy of your quote that you can use for future reference. Your email address is not required to receive an instant quote.